Known As A Collector, Gustave Caillebotte Gets His Due As A Painter Caillebotte was an independently wealthy artist who — unlike his Impressionist buddies — didn't need to sell paintings to make a living. Now, many of his works are on display at the National Gallery. 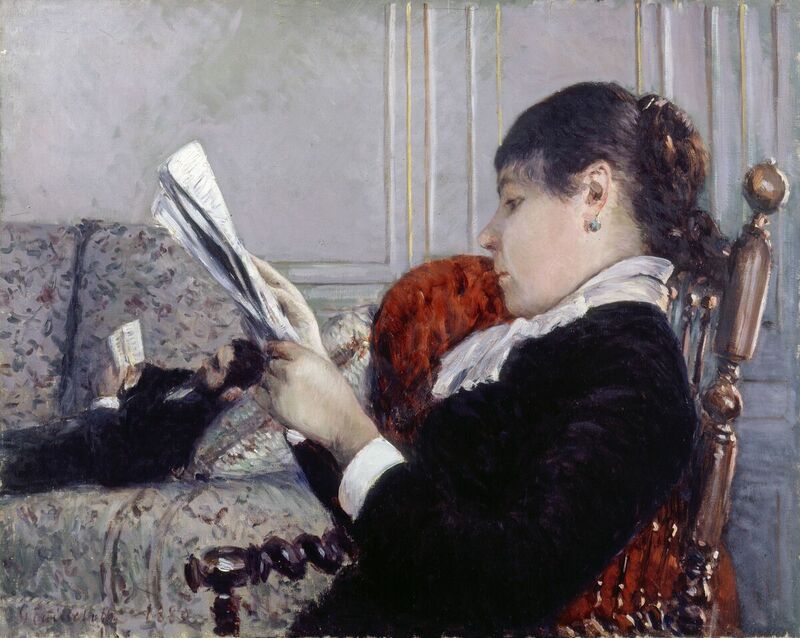 Gustave Caillebotte plays with perspective in his 1880 work Interior, A Woman Reading. If you're planning to become an artist, here's one nice way to do it: be independently wealthy, easily pay your bills without needing to sell your own work, buy up the paintings of your marvelously talented friends, and then give their works to the nation. A little-known 19th-century artist named Gustave Caillebotte did just that, and there's a big show devoted to him at the National Gallery right now. 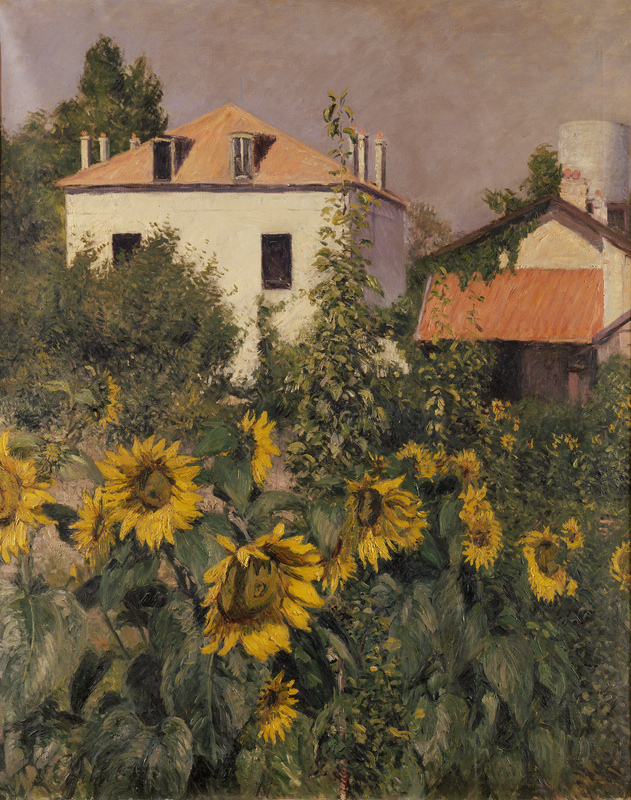 Caillebotte shows a cheerful scene in his 1885 oil on canvas, Sunflowers, Garden at Petit Gennevilliers. Because Caillebotte didn't need to sell his paintings, many of the works now on display had previously been seen only by private collectors and his family. Marie-Claude Chardeau is a family member who loaned works to the show. She owns Sunflowers, from 1885. It's a "swell" painting, she says, that makes her feel as if she is in the middle of a garden. The painting shows a sea of cheerful sunflowers in front of a cozy farmhouse. It would brighten even the rainiest of days. Caillebotte's best-known work, owned by the Art Institute of Chicago, depicts one of those rainy Paris days. His 1877 painting Paris Street, Rainy Day, shows top-hatted men, and women in long dresses, walking on wet cobblestone streets past imposing wedge-shaped buildings. They are sheltered under dark umbrellas. "It's what we think about Paris — it's what you see in movies," says Chicago curator Gloria Groom. Caillebotte puts you right on the sidewalk in Paris Street, Rainy Day, 1877. You feel you're walking into the immense painting, Groom explains, because of Caillebotte's bold perspective — the buildings far in the background, and one umbrella-ed couple up close, maybe about to walk right past you. When it was shown, Groom says, it was criticized for depicting umbrellas that looked like they were bought at a department store; supposedly it "cheapened" the work's monumental scale. "They all look alike because they are mass manufactured," Groom says. "And he's showing each person kind of in their little world of the umbrella." 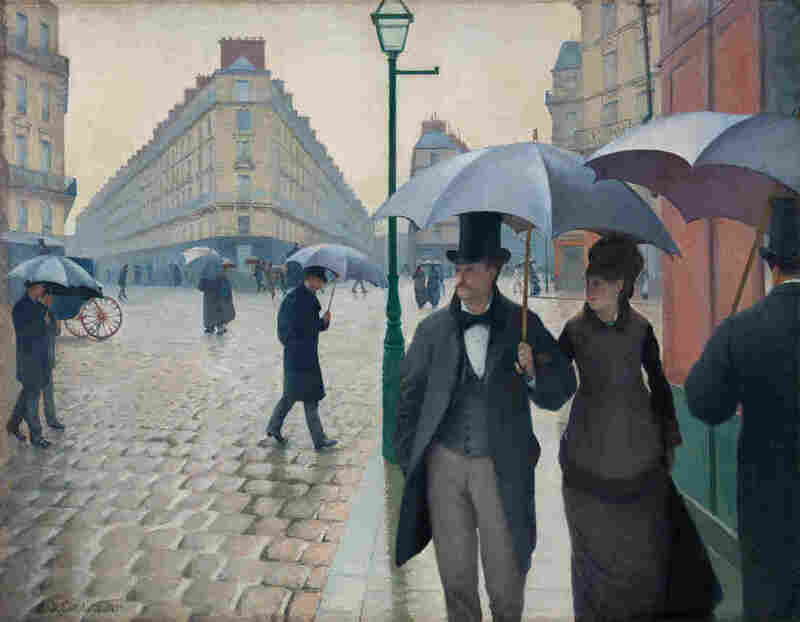 Beneath their umbrellas, Caillebotte's people seem isolated — alienated on that slick, wet street. He's painting modern life, as medieval Paris gets ripped up for broad new boulevards and lines of trees. A few years earlier, Caillebotte had done an indoor scene that National Gallery curator Mary Morton says launched his career. Caillebotte made The Floor Scrapers in 1875. It was a painting of three laborers at work preparing his first studio. It was in what was then the relatively new neighborhood of the 8th arrondissement, where Caillebotte's father had bought a "great pile," according to Morton. "It's a beautiful place to live and his father is very kind and supportive and starts building out a painting studio for his son," she says. 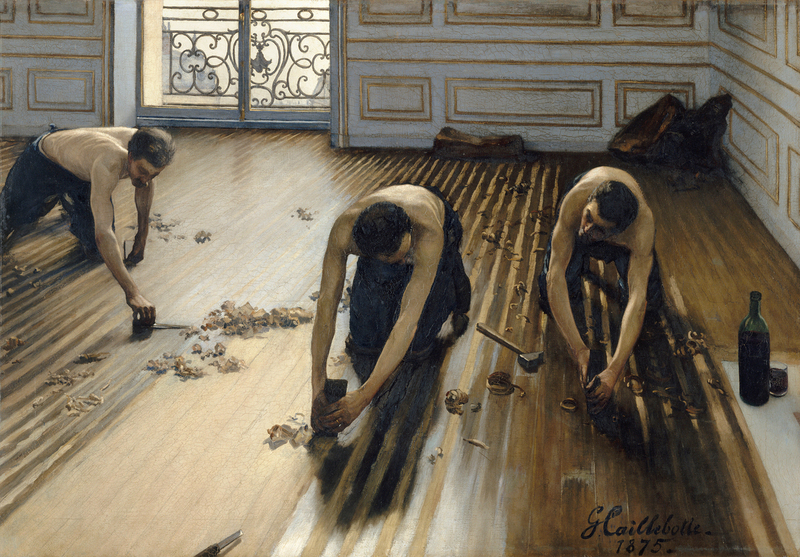 In Caillebotte's angled, unusual painting, he shows bare-chested workers kneeling on the ground as they reach with their skinny, muscled arms to smooth out the floor. Caillebotte's 1875 painting The Floor Scrapers was rejected by the elite Salon, but it was the work that launched his career. Caillebotte submits this picture to the Salon — the elite Fine Arts Academy show in Paris — and it causes a sensation. Laborers!? Working people!? The jury rejects it. But Caillebotte's name starts to get around. His art, with its dramatic perspectives and odd subject matter, is unusual — very different from his renegade pals, the Impressionists, with their light-filled brushstrokes and sunshine scenes. But he exhibits with the Impressionists — for a while. 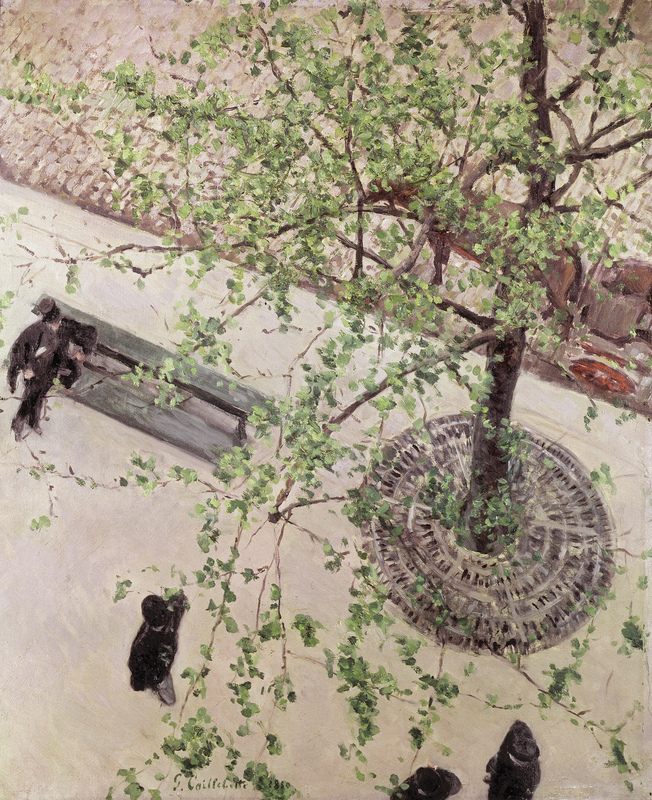 Caillebotte looks on the Paris streets below in The Boulevard Seen from Above, 1880. "His father made a lot of money," says co-curator George Shackelford of the Kimbell Art Museum. The elder Caillebotte sold blankets and other materials to Napolean's army, Shackelford explains. He "made a fortune and reinvested it in real estate and so Caillebotte literally lived on rent." By the time he was 26, Caillebotte had inherited that fortune — and Morton says that affected his attitude. "He doesn't have that drive and motivation that all the other guys do to make art to live," she says. "He does not need to make this art. But he is really inspired from '75 to about '82, and I think ... it's about this movement, this fraternity [of artists] — they're changing the course of French painting, and that's the way they are talking to each other." 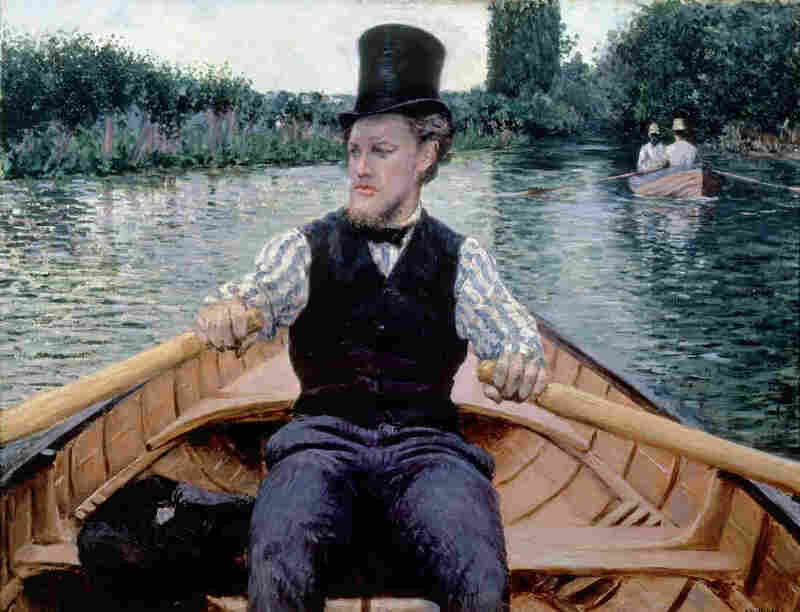 Caillebotte made only some 500 paintings in just a few years, and then turned to other interests — boating, gardening — before he died at age 45. All along, he'd stayed in touch with his artist friends — Monet, Renoir, Degas, that bunch — and bought lots of their work. "He lived in comparative luxury and could buy these paintings from his friends, and would buy them not out of charity so much, but very much looking to give his friends cash money," Shackelford says. That's how Caillebotte ended up with one of the great collections of Impressionism. When he died in the 1890s, it went to the French government. Today those works make up the core of the Musée d'Orsay's great Impressionist collection. And Caillebotte — known more as a collector than as an artist — is now getting attention for the paintings he created: strong scenes of urban life, boating, portraits, food (his bloody calf's head and ox tongue, hanging in a butcher shop, will spoil your lunch today). Caillebotte painted the new realities of 19th century Paris. We're passengers in a boat in Caillebotte's 1877-78 Boating Party.